In the beginning of a business venture, entrepreneurs wear many hats. Business owners handle marketing, sales, operations, accounting and finance often single-handedly. As a business grows it is unrealistic to maintain that level of involvement in everything from long-term strategy to personally completing all the daily tasks that make a business hum. That’s when you begin to carefully select individuals, experts in their areas with a heart for your company’s mission and goals, to form a team to take your business even further. Inevitably members of your team urge you to the realization that it makes sense to look at outsourcing a specific business function. And they’re right! The depth of experience companies in a targeted industry can bring to your business processes can be invaluable. Often the function in question can be completed with much more efficiency, and less expense, than you can accomplish within the organization. So now you’re considering outsourcing one or more business functions. But trusting a part of your business to another company, a group of individuals with different goals and values, can be tough. How do you ensure you are partnering with the right outsourcing provider? Borrowing tips from the consulting world will lead you to the right way to evaluate your outsourcing options. 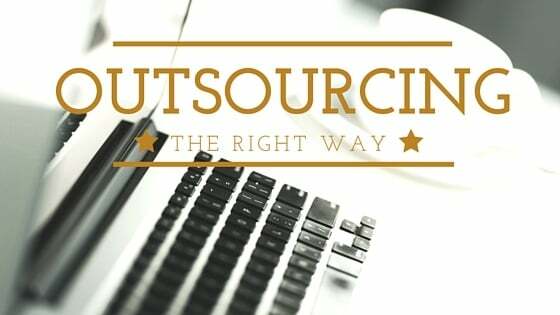 Follow these steps when evaluating your outsourcing options to find the best possible fit for you and your team. 1. Identify your stakeholders. It is important to understand who has a vested interested in the business process being outsourced, starting with employees and extending to clients, partners, and shareholders. Communicate early and solicit feedback throughout the process. This is important for two reasons. First, you are not the exclusive subject matter expert. Those who work with the process every day have golden nuggets of information that will help you to select and onboard the right vendor. Second, it’s important to get buy-in from all those involved so the team can move through the project in the same direction with as little friction as possible. 2. Define your goals. Start by speaking with those most familiar with the process. Find out what works with the current process and what doesn’t quite work the way you’d like it to. Create a set of outcomes you expect from the outsourcing process. It could be time saved, expenses lowered, mistakes reduced. Assign quantitative goals you can measure prior to the implementation of an outsourcing solution and again post implementation. Additionally, list specific features that you’ve determined are must-haves for this process to work and keep them front and center during the vendor evaluation period. 3. Sharpen your pencil and dig in. Be sure you know as much about your prospective vendors as possible. The majority of your initial research can be conducted online. a. Thoroughly read the company website, including mission, values, history, team members, awards, list of clients, testimonials, etc. b. Conduct a search via Google and click on news to see recent media coverage of the company. c. Check the Better Business Bureau rating and details of any complaints lodged. d. Call the vendor's customers and hear first hand how their service measures up. 4. Don’t be led off course. To ensure your very unique and specific needs are met at the conclusion of this journey, it is important for you to set the course and pace of every interaction with your potential vendors. Your outsourcing prospects will spend a lot of time covering their competencies, which may or may not align with your goals. If not, steer them back to discussing the features and services that are most important to you. That will allow you to get the information you need to evaluate each vendor against those features and complete a best case apples-to-apples comparison. 5. Beware of mudslingers. A company vying for your business wouldn’t be very effective if they didn’t communicate their unique positioning and what makes them different and better than their competitors. However, there’s a line between pointing out the measurable differences and trash-talking the competition. This should be a red flag. A sales rep who mudslings can be an indication of a deeper cultural issue within the organization. It’s probably not an organization you want to trust with any part of your business. 6. Select the best fit. Make sure you award your business to the vendor that has earned it. Choose the vendor that displays true investment in your success and has taken the time to understand your industry, your company, your internal and external clients and your goals. Vendors that care and really want the business will do their research, come prepared and you’ll walk away from each interaction having learned something helpful. 7. Make room for onboarding. The project doesn’t end after you’ve selected a vendor. Many companies underestimate the resources needed in the first weeks of outsourcing a business function. Make sure you’ve had the discussion with your new vendor and that you set aside the appropriate amount of time to get the process up and running. It’s important to set realistic expectations and plan accordingly to avoid a rocky start. 8. Perform a postmortem. To fully understand the effectiveness of the new process, you should plan to spend time performing a postmortem, a look back at your defined goals and how you are measuring against those goals after a certain period of time, say 90 days depending on the specific business process involved. Most often you’ll find areas that can be improved and communicating openly with your new vendor about the changes you’d like to see is paramount. Take the time to have an open discussion covering the positive and negative outcomes and commit to working through improvements. Expecting a perfect transition is unrealistic, but you should find that you’ve met most of the goals you set out early in the process and are in a better place overall than when you started. For resources to help you find the best payroll company for you and your employees, see How to Choose a Payroll service.